We have links to lots of fantastic free online adding games to help you practise addition skills. Start with counting and combining two groups of objects then move on to recognising the plus and equals sign. Playing lots of adding games will help you to learn and memorise number bonds. Practise early addition skills with Count Hoot from BBC Schools. Level 1 tests your knowledge of number bonds to 10 using the dots on ladybirds. In level 2 you work with numerals instead of dots and level 3 uses number bonds to 20. In this game from ABC you have to put a given number of kids into the double-decker bus. To do this, drag them from the bus stop to a bus window. They can't all fit on one deck, so they have to be split into two groups and the front windows of the bus explain how you have made up the total. Click the check number button to see whether you are right. A two-player game from Oswego. First choose the total you want to practise, from 5 to 99. When you see a pair of ghosts that add together to make your target number, player one hits the Z key and player two the M key. Whichever player hits the key first gets the point. If you press your key when the ghosts don't make your target number, you lose a point. Great spooky sound effects. Use the X and Z to turn one dial and the left/right arrows to turn the other dial. Can you crack the safe by finding two numbers that add up to make the target number? If you answer enough questions correctly you will get a bonus asteroid-style game. ICT Games. Count the bugs on the first leaf then those on the second leaf. They will all hop onto another leaf where you can count them altogether to get the total. Dositey. On the first screen you can choose how many questions you want to set the challenge to and how much time you want to do it in. Then you have to choose from the grid two numbers which add up to the required total. The image on the left links to Level 1, but if that's too easy, you can always try Level 2 or Level 3. Oswego. This game uses an addition grid with the numbers 0 to 9 along two sides. Drag the number tile to a place where it fits on the grid, e.g. you could put the 10 where the 6 column and 4 row intersect. When you have uncovered enough squares the picture will be revealed. Harcourt School Publishers. Fly your spaceship into the fuel pods, making sure you don't pick up too much fuel. This game introduces the idea of adding more than two numbers to make a total as you collect the fuel bit by bit. ICT Games. First you can set the number of sums to do and a time limit. When the game starts you have to drag the tile digits into place so that you end up with a sum which makes sense. In this game you will be adding single digits. Sometimes the answer is one digit and sometimes two. Oswego. Choose a UFO with a sum on it and click, then click the answer in the grid. A picture is slowly revealed as you clear the correct answers. A fun way to practise single digit addition from Dositey. This is a great problem-solving game from Oswego that challenges your brain. You have to drag the numbers onto the grid, making sure that the total of each line matches the target number. If you do well you will get a password to the next level. This is a two-player game, although it could be played by one person or with two teams using an interactive whiteboard. You have to add 10 to the number shown. Get it right and your submarine will fire at the other player's. ICT Games. You can choose from three levels which will take you from single to double-digit addition. 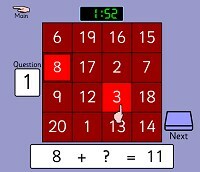 Flick one of the level switches to see a sum, then type in the answer and click the red button to check your answer. Ambleside Primary School. A very flexible way to practise addition facts from Oswego. 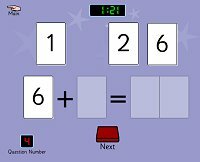 You can choose mixed sums at two levels or practise adding a specific number from zero to 9. You need quick recall to beat the timer. 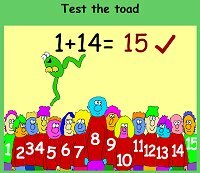 This game from Crickweb tests your knowledge of addition. Choose level 1 for addition facts up to 20 or level 3 for addition up to 100. Just type your answer and click the green button to check.